Leader- Shinningstar: Light gray she-cat with light blue eyes. Deputy- Tumblefoot: Black,clumsy tomwith brown paws and tail. Green eyes. Medicine-Cat- Sweetbreeze: Cream colored she-cat with hazel eyes. Swiftwater: Black and white tom with deep blue eyes. Lionsong: Handsome golden tom with golden eyes and a mane around his neck. Queens- Pricklethorn:White she-cat with golden tabby markings on her tail.Sister of Lionsong and mother of Tumblefoot's kits; Honeykit and Fuzzykit. Madilan: Solver,log feathery coated she-cat with a black underside. Mother of Wolfkit and Poppykit. Twigpaw: Light brown she-cat with a white underside. Green eyes. Rockpaw: Silver she-cat with light blue eyes. Leader- Stormstar: Gray tabby tom with blue eyes. Deputy- Hawkwatcher: Gray and brown tabby with peircing amber eyes. Medicine-Cat- Iceheart: White she-cat with blue eyes. Rainnose: Tortie tom with a gray nose.Brown eyes. Yellowbelly: Cream colored she-cat with a yellow belly.Amber eyes. Leafflight: Brown,long haired tom with hazel eyes. Queens- Stumpyfoot: Tawny colored she- cat with emerald eyes and has a stumpy leg. Mother of Rainnose's kits; Jadekit(Brown she-cat with green eyes) and Tanglekit(Dead grass color with yellow eyes). Elders- Vinestripe: White tom with strips of green(grass stains) on his pelt.Yellow eyes. Leader- Sandstar: Pale ginger she-cat with orange eyes. Deputy- Scortchtail: Ginger tom with green eyes. Stonetooth: Dark gray tom with tan teeth. 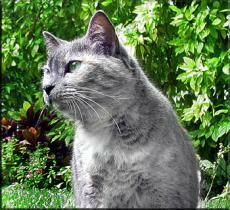 Bubbles: (Former Kittypet) Light gray tom (With darker flecks) with ver light blue eyes.